(Central Islip, N.Y., June 6, 2016) – Long Island Ducks right-handed pitcher John Brownell tied the franchise’s all-time records for wins and games started by a pitcher on Sunday, June 5 during the Ducks’ 9-1 victory over the Sugar Land Skeeters at Bethpage Ballpark in Central Islip, N.Y. Thanks to his complete game effort on Sunday, Brownell earned his 40th win and 91st game started in his five seasons with the Ducks. Those numbers equal the totals set by left-hander Randy Leek while pitching for Long Island from 2007-10. The 32-year-old’s first opportunity to grab sole possession of both records is scheduled for Saturday, June 11 when the Ducks face the Southern Maryland Blue Crabs in Waldorf, Md. 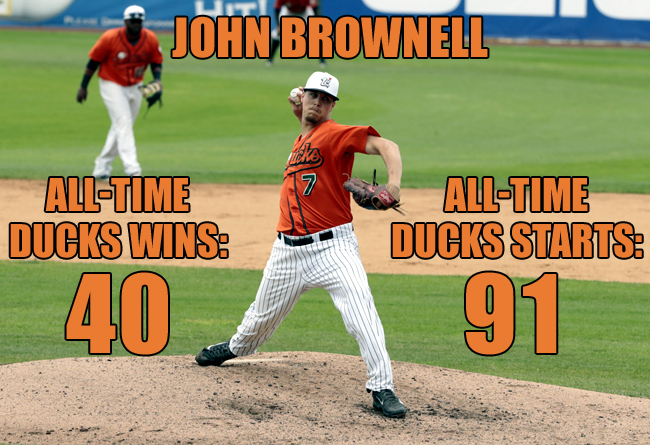 Brownell has already surpassed Leek for the franchise records in strikeouts (461) and innings pitched (604.1). In five seasons with Long Island, the Omaha resident has compiled a 40-28 record with a 3.68 ERA during the regular season. His best season came in 2015 when he compiled a 12-6 record with a 3.38 ERA and a single season team record 146 strikeouts in 26 starts. He became the second pitcher in Ducks history to be named the Atlantic League’s Pitcher of the Year, joining Mike Loree (2011). The former Phillies draft pick won back-to-back Atlantic League championships in 2012 and 2013 and was named the Championship Series Most Valuable Player in 2013 after collecting a pair of wins over the Somerset Patriots.